‘Sai Niwas’ is the abode of the Shri Sai Satcharita, the holy scripture most dear to numerous Sai devotees. It describes the various ways in which Sai devotees secured the grace of Shree Sainath. This place is where resided Shree Govind Raghunath Dabholkar, more popularly known as Hemadpant, who authored Shree Sai Satcharita at the behest of Sainath himself. Hemadpant visited Shree Kshetra Shirdi in the year 1910, to seek darshan of Shree Sainath. During his very first meeting itself, Hemadpant sought Baba’s dhul bhet (rolling completely from head to toe in the dust at the Sadguru’s feet) and surrendered himself entirely to Sainath. It was Sai Baba who conferred upon him the title, ‘Hemadpant’. Hemadpant undertook the composition of “Shree Sai Satcharita”, as a collection of stories describing the Leelas (divine play) of Shree Sainath and the experiences of the Sai devotees. I am but a servitor at your feet. Therefore, do not disappoint me. So long as there is breath in this body, make me an instrument of thy work. Hemadpant composed the ‘Shri Sai Satcharita’ at Sai Niwas as he imbibed the verse in his life. Today, Sai Niwas, located at Bandra, Mumbai is over a 100 years old and finds its mention in ‘Shri Sai Satcharita’. After seeking permission from Sainath, Hemadpant began the construction of this structure, in the year 1911. The structure was designed and constructed as per Sainath’s guidance. “This home belongs not to me but Sainath,” was the humble sentiment behind the construction. It was completed around 1913, and the building was named as ‘Sai Niwas’. Hemadpant’s descendants have well preserved the sanctity of the place. Currently, Hemadpant’s grandson, Shree Govind Gajanan Dabholkar (Appa Dabholkar) and his family live here. The opportunity of paying a visit to the holy place filled with Sainath’s love, grace and blessings is available to just about anyone who wishes to seek its darshan. Chapter 40 of ‘Shri Sai Satcharita’ describes the account of the arrival of Sainath at “Sai Niwas” as per Hemandpath’s vision of him on the night of Holi Pournima in 1917, which realised in the form of a portrait. The day of Sainath’s arrival is celebrated at Sai Niwas with great devotion, even today. 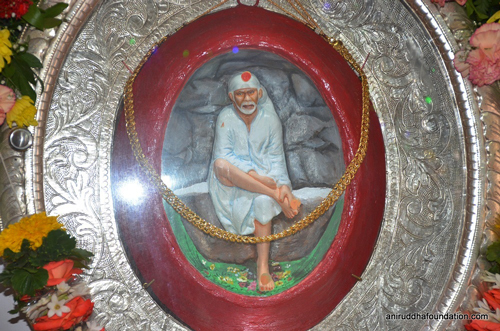 In the past, Sai’s portrait was open for darshan to devotees only on the occasion of Holi Pournima. Later, as per the wishes of Meena vahini (Hemadpanth’s granddaughter-in-law), the portrait of Sainath was opened for darshan to devotees, on all days. Furthermore, under the guidance of Sadguru Shree Aniruddha, an exact replica of the portrait of Shree Sainath was created in the form of an idol, which is also open for darshan to devotees. While looking upon Shree Sainath’s idol, Shraddhavans may chant the jap, “Om Krupasindhu Shree Sainathaya Namah |” at Sai Niwas. Many Shraddhavans experience a sense of immense mental peace while chanting the jap. The desk on which Hemadpant scripted Shri Sai Satcharita can also be viewed at Sai Niwas. 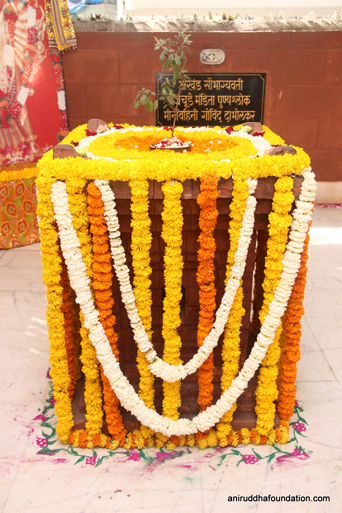 A Tulasi Vrundavan has been erected at the Sai Niwas backyard, in the loving memory of Meena vahini. Shraddhavans may also avail the darshan of a full-sized portrait and padukas of Sadguru Shree Aniruddha and perform circumambulation around the Tulsi Vrindavan during their visit. Shraddhavans, who so desire, also light the Sudeep(holy candle) here. The Holi Pournima festival is celebrated at Sai Niwas every year. In 2017, a Shatabdi Mahotsav was celebrated as well to commemorate the centenary of Shree Sainath’s arrival in the form of a portrait at Sai Niwas. Many spiritual events were organized on the occasion. 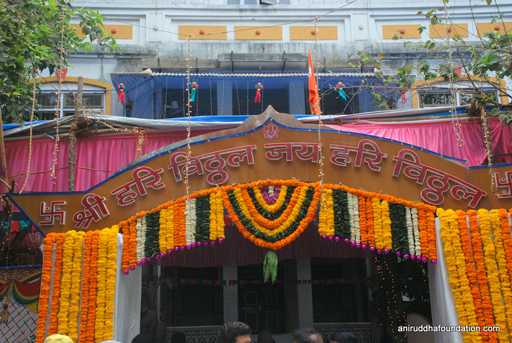 The Sadguru Navaratra is said to be celebrated at a place, which has experienced the presence of two forms of the Sadguru. The Navaratra(a celebration of nine days) is celebrated in the month of Ashwin, from Ashwin Pratipada to Dussera. The Sadguru Navaratra is thus, celebrated at Sai Niwas under the guidance of Sadguru Shree Aniruddha since 1997. Also, an aarti is performed at Sai Niwas every evening at 7 pm, which is followed by the recitation of one of the following stotras, Hari Path, Shiv Path, Aniruddha Path or Ganapati Atharvashirsha. Sai Niwas is located in Bandra, Mumbai and is a 10-minute walk from Bandra Railway Station. Sai Niwas, St. Martin Road, Bandra (West), Mumbai 400 053. Every day (except on Thursdays): In the morning from 8.00 am to 1.00pm, and in the evening from 4.30 pm to 10.00 pm. On Thursdays: From 8.00 am in the morning to 4.30 pm.